A double sink gives you twice the room to get ready. If you're thinking of updating your bathroom and it's large enough, consider changing out your single sink vanity and replacing it with a double sink for bathrooms. We stand at the sink to wash our faces, brush our teeth, shave, style our hair, put on make-up and more. Time constraints when getting ready in the morning can create quite a brouhaha within the household when more than one person needs to get ready for school or work and is clamoring for the use of the sink in front of the bathroom mirror. That's right; the issue isn't so much fighting over the shower or tub. It's sink time in front of the mirror. 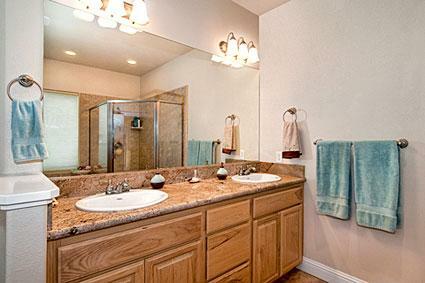 Having a double sink installed can help alleviate bathroom congestion. Does it compliment your bathroom décor? Does it provide the storage you're looking for? How much plumbing work will be required to install it? At one time double sinks were considered a luxury item in more expensive homes. But with today's busy lifestyle, they have become a functional part of morning routines in less expensive homes as well. Once you have a double sink installed in your bathroom, you'll wonder how you ever did without it. And today, furniture vanities provide choices in styles never before available. You'll find selections crafted from woods and veneers offering custom and one-of-a-kind looks for your bathroom. This Lancaster double sink vanity comes in a medium brown complimented by a cream-colored marble top. The two sinks are a bisque porcelain featuring antique brass faucets. This one offers plenty of storage, with three drawers and two one-shelf cabinets at each end. Cole and Company's Potomac double sink chest has a rich, hand-distressed, black rub-through finish, providing old-style warmth and elegance with hand-painted gold detailing. The three drawers and four doors provides plenty of storage. Global Treasures' Stockton double bathroom vanity offers carved decorative accents in a cherry cabinet complimented by a black and white marble top. The sinks are white porcelain.These few samples are just that--samples; a smattering of the host of furniture vanities offering unique looks for a double sink for bathrooms and your remodeling project. A double sink bathroom vanity offers space for two people to use the bathroom at the same time and is a great way to upgrade your master bath and add resale value to your home. Not only does it allow couples to get ready without being rushed, it also provides more storage to help keep the bathroom uncluttered and organized. Home buyers find these features desirable when searching for their next home. So whether you plan on remodeling the bath for your own use or because you plan to sell your home, adding a double sink to your bathroom is a worthwhile project.